Dear followers of Jesus: grace, mercy, and peace to you from God the Father and our Lord and Saviour Jesus Christ. Amen. We live in days when pretty much everyone is pretty much always offended. Everyone is so self-centred that they cannot even tolerate hearing a point of view different from their own. People are offended by natural marriage and families. People are offended by those who want to protect the lives of the unborn. People are offended because everyone doesn’t bow down to their newly fangled ideologies and perversions. As the morals of society change, what is offensive changes. This is certainly reflected in the media. Things that used to be offensive to society and would never have been seen in television and movies are now common in most media. Yet things that used to be common in older movies and shows are now deemed offensive. What has not changed and will not change is that the world will be offended by Jesus. Jesus has not changed. His Word is the same as it has always been. When people are offended by what Jesus says, they either twist it or stop listening to it. In our Gospel lesson, many of Jesus’ disciples were offended by Jesus. They had been following Jesus, but then He said something that offended them, and they turned back and no longer walked with Jesus. They said, “This is a hard saying; who can listen to it?” They said that Jesus’ Word was difficult to accept, intolerable, and offensive. They did not want to listen to Jesus’ Word. They didn’t want to listen to Jesus. Jesus was teaching them about the manna God’s people of old received from heaven, and said about Himself that He is the bread that came down from heaven; that He is the bread of life. Those who ate the bread in the wilderness died, but those who eat the bread of life will live forever. Whoever feeds on Jesus’ flesh and drinks His blood has eternal life. Many of Jesus’ disciples didn’t like Jesus’ interpretation of the Scriptures as He taught them in the synagogue that day. They thought they could be disciples of Moses and followers of the Scriptures and faithfully attend the synagogue, but reject Jesus. They neglected to understand that the Scriptures speak about Jesus; that Moses spoke about Jesus; that the synagogue was the place to hear about Jesus. The Scriptures all speak of and point to Jesus for eternal life. He was there before their eyes and they were offended, and they rejected Him and refused to hear Him teach anymore. The words that Jesus said are spirit and life to them, they did not want to hear. We too can be offended by Jesus’ words. We too have been so influenced by the rapid demoralization of the world around us that Jesus’ words can offend us. Jesus tells us to purge the unrepentant person from the church (I Cor. 5:13), but that sounds offensive and unloving to world-influenced ears. Jesus tells us to practice closed communion (I Cor. 11:17-32), but that too sounds offensive to world-influenced ears. Next week’s Epistle lesson tells wives to submit to their husbands as to the Lord (Eph. 5:22). There’s not much that will more offend this feministic society we live in and those influenced by it. However, the reality is that the Law of God is not what causes people to stop walking with Jesus. That God gives rules and has standards for behaviour does not cause people to part from Him. Everyone expects that God should have standards and rules. Look at what happened to the disciples in our Gospel lesson. Jesus didn’t give them an extra commandment, causing them to say, “Hold on, that’s one too many. We’ll take the Ten Commandments, but we can’t handle eleven.” They didn’t fall away because Jesus told them to work for their daily bread. They fell away from Him because He said that He is the living bread that will cause all those eating His flesh to live forever. Instead of giving them more rules, He was giving them Himself and thus promising them eternal life; promising to raise them on the last day. Jesus said, “I am the living bread that came down from heaven. If anyone eats of this bread, he will live forever. And the bread that I will give for the life of the world is my flesh.” Many of Jesus’ disciples found this offensive. When we find God’s Word offensive, we need to drown the Old Adam is us by contrition and repentance. We may not understand why God says what He says, but we must cling to His Word as the truth, because it is the truth. The cross is a scandal and an offence because we don’t want to admit that we are sinful. We don’t want to admit that it was for our sin that Jesus suffered and died. We don’t want to admit that we need God’s forgiveness every day. Yet, Jesus gives us the forgiveness of our sins. He gives us the gift of faith. He gives us His true body and blood. We feed on His flesh and drink His blood, so Jesus promises us that He is in us and we are in Him. He promises us that we will live because of Him. He promises us that He will raise us on the last day and we will live forever. Do we understand this perfectly? No, but we still trust Jesus’ word. You trust Jesus, because you know He is God of God, Light of Light, very God of very God. You trust Jesus because He is the one who took all your sins onto Himself and suffered and died for you, taking the punishment you deserve because of your sins. You trust in Jesus because He gives you His body and blood to eat and drink so that you believe and have come to know that all your sins are forgiven and you will live forever. There will always be those who are offended by Jesus and thus turn away from following Him. We however will follow Him, because God the Father has granted to us to come to Jesus. We follow Him because He paid the price of our sins. We follow Jesus because He alone has the words of eternal life. Amen. Dear people saved from the devil: grace, mercy, and peace to you from God the Father and our Lord and Saviour Jesus Christ. Amen. This is understandable. It is not nice or pleasant to hear about the devil. Yet, it is important that we hear about him. It is important that we hear about this great enemy of ours who is scheming to tempt us and prowling to devour us. It is important that we know that he is wily and cunning, a murderer and a liar, and that we understand that he unceasingly wages war on the Church of God through every means possible. This means the devil wages war on you. Ever since tempting Eve to eat the forbidden fruit, the devil has been tempting mankind to question what God says. “Did God actually say, ‘You shall not eat of any tree in the garden’?” he asked, twisting God’s Word. (Gen. 3:1) “Did God actually say,” the devil continually asks. The devil has his successes. The Bible tells us the devil incited King David into sin which resulted in God striking the people of Israel so that 70,000 men died from pestilence (I Chron. 21). The devil enticed King Ahab into a war which resulted in his death (I Kings 22). It is the devil who forbids marriage (I Tim. 4:1-2) and who tempts married people to infidelity (I Cor. 7:5), which we know goes everywhere. The devil snatches God’s Word out of hearts who hear so that they would not believe and be saved (Luke 8:12), and he sows his evil children among the children of God to cause strife, discord, and fighting even in the church (Matt. 13:38-39). Unbelievers are completely under the power of Satan until God’s grace and power deliver them from the domain of darkness and transfer them into the kingdom of His beloved Son, in whom we have redemption, the forgiveness of sins (Col. 1:13-14). This then is why we hear about Jesus casting out a demon in Epiphany. Yes, it reveals that Jesus is God, but it also reveals that the coming of the promised Saviour means that the reign of God has arrived in the person of Jesus, as He takes men captured by the devil away from the devil with nothing more than His Word. “Be silent, and come out of him!” is the command from Jesus for the devil to release his grip on the man and depart. It is the revelation that Jesus was beginning to turn back the forces of the devil and drive him to destruction. Just before His crucifixion, talking about His own death, Jesus announced, “Now is the judgment of this world; now will the ruler of this world be cast out.” (John 12:31) Jesus’ death appeared to be Satan’s victory, but in reality, it meant his overthrow. It meant the casting out of Satan from power and his reign ended. The world was judged when Jesus was judged. The world was found guilty, but Jesus took that guilt on Himself. Jesus was punished for the sins of the world as He suffered and died. Death was unable to keep Jesus. Jesus defeated death by rising from the dead. This means that Satan’s threats of death because of our sin are vain and useless. Our death is now nothing to fear, since we will rise from the dead as Jesus rose from the dead. Everyone who is in Christ has conquered death. Everyone who is in Christ will rise to everlasting life. Thus, remain in Christ. Remain in Christ by remaining in His Word. Remain in Christ by receiving His body and blood. Being in Christ is your protection from Satan and his attacks and temptations, and from his fiery darts with which he seeks your eternal ruin. Do not think that God gave you His Word for nothing. Do not think Christ commands you to abide in His Word (John 8:31) for no reason. God gave you His Word and commands you to abide in it because you cannot defend yourself from the devil on your own. Abide in Christ’s Word so that you will not fall for every trick and temptation of the devil. If you do not abide in Christ’s Word, when the devils tempts you and asks, “Did God actually say…” you will have no idea of what God said or didn’t say. If you do not abide in God’s Word, you will be blown around by every false teaching and false teacher because you do not know what God has actually said. Christ’s body and blood keep you in Christ, which means His righteousness and perfection cover your sin. Christ’s body and blood keep you in Him, safe from the devil’s ugly accusations, safe from a guilty conscience, safe from hell. Christ gives you His Word and His body and blood because He doesn’t want to lose you. He refuses to allow the devil to take you. He yearns jealously over you (James 4:5) because He wants you completely for Himself. The devil is more powerful than we are. He is smarter and more cunning than we are. He is our great enemy who is scheming to tempt us and prowling to devour us. But he cannot have us. He has been defeated and his power has been destroyed. He bit Jesus’ heel, but he bit off more than he could chew as Jesus crushed his head. Christ has given us His Word so that we won’t fall for Satan’s twisted lies. Christ gives us His body and blood, so that even when we do fall into sin, the devil still can’t have us. Christ’s Word and His body and blood strengthen and preserve us in body and soul to life everlasting. That’s why we can talk about the devil all we want without fear or unpleasantness. The devil is powerless. He’s been cast out. He may convulse and cry out like the demon did, but he must obey Christ who conquered him. His reign is ended. His power is gone. Did God actually say that the devil, the ruler of this world be cast out? Yes, He did, and then He died and rose again, and actually did what He said and cast the devil out. His power over us is finished, and we do not need to fear him. That is both a nice and pleasant thing to hear. Amen. Dear people who hear the Word of Jesus: grace, mercy, and peace to you from God the Father and our Lord and Saviour Jesus Christ. Amen. “Come and see.” With these words, Philip invited Nathaniel to come and hear Jesus. It’s not a very complicated evangelism program. It is a simple invitation to come hear Jesus’ Word. When we think of evangelism, that’s not what we normally think about. There are those who would like to sell us on the idea that evangelism is handing out tchotchkes like What Would Jesus Do bracelets, Jesus Loves You pens, or craftily devised cards and pamphlets. They would like to sell us on the idea that evangelism is wearing a God Loves You T-shirt, putting a float in a parade, and leaving gospel tracts in public bathrooms. You cannot convince someone to believe. I cannot convince someone to believe. The only way that anyone comes to faith is through the Word of Jesus. The only way that anyone comes to faith is through hearing that you are a sinner in need of forgiveness and that Jesus has died for you and gives you forgiveness freely. This we hear in Jesus’ Word. Furthermore, inviting someone to see what goes on in church… well frankly, that’s a little embarrassing. There’s not too much to see that goes on here. Inviting someone to go to the football game? Well, that’s exciting! Inviting someone to our favourite concert? Well, that sounds great! Inviting someone to see the latest blockbuster at the theatre? Well, that’s some real action and exhilaration! But inviting someone to church? Boring. Not too much to see here. We sing. Sometimes not so well. A pastor talks. We sing some more. Maybe a song we don’t know so well, so that’s no good. The pastor talks again. He gives out a little wafer of bread and a sip of wine. We sing. Then we leave. Not so much to see. The truth is, if that is all that happens here, we shouldn’t invite anyone to church. We ourselves shouldn’t come either. By every worldly standard, there is no greater way to waste your time on Sunday morning. If what we see is what we get, stay home. Is that all that happens here? Come and see. It is true that we don’t have exhilarating close calls on the side-lines or the latest beats. We don’t have Dolby digital surround sound or action sequences that make our hearts race and put us on the edge of our seats. We do have something far better. We have the Word of Jesus, which is the Word of life. We have God’s voice from heaven, printed on pages we can read, and which can be read to us. We have something better than seeing heaven opened, and the angels of God ascending and descending on the Son of Man. Heaven is open as we join the angels and archangels in praising God with the same words they sing in heaven. Heaven is open as we join our loved ones who have died in the faith in communion with each other and with Jesus Christ, the head of the Church. Heaven is open as the Son of Man descends here with His true and resurrected body and blood, so that we will ascend into heaven with Him. We don’t see it. We can’t see it. Thus, we fight against this also. It cannot be. I don’t hear the angels. I don’t see my loved ones. I don’t see Jesus. You cannot convince someone to believe. I cannot convince someone to believe. The only way that anyone believes is through the Word of Jesus. What is this Word of Jesus? Jesus says, “Take eat; this is my body… Drink of it, all of you, this is my blood… for the forgiveness of sins.” (Matt. 26:26-28) It is as simple as that. And, “You have come to… the heavenly Jerusalem, and to innumerable angels in festal gathering, and to the assembly of the firstborn who are enrolled in heaven… and to Jesus, the mediator of a new covenant, and to the sprinkled blood that speaks a better word than the blood of Abel.” (Heb. 12:22-24). It is as simple as that. Yes, come and see, but you may not see what you want to see. Do you think there was so much for Nathaniel to see when Philip invited him to come and see Jesus? Come and see Jesus of Nazareth, the son of Joseph. Come and see the blue-collar worker’s son from the despised city of Nazareth, where no one expected any good to come. Come see the carpenter’s son who was born in an animal feeding trough and had to flee from danger like any ordinary, weak human. To identify Jesus as the one of whom Moses in the Law and also the prophets wrote, as Philip did, was not the result being convinced by seeing anything special in Jesus. He looked like an average man from a below-average town. Do you think that the disciples in the upper room saw any more than we do, when Jesus said, “Take eat; this is my body… Drink of it, all of you, this is my blood…” Do you think they saw more than bread and wine? They did not. There was no special light or sound show that accompanied Jesus’ institution of the meal. Do you think the disciples who believed in Jesus saw a special twinkle in His eye as He walked about teaching? Do you think that Jesus had a halo around His head everywhere He went as He is typically depicted in drawings and art? I assure you, He did not. Isaiah writes that Jesus had no form or majesty that we should look at Him, and no beauty that we should desire Him. He was despised and rejected by men; a man of sorrows and acquainted with grief (Is. 53:2-3). Jesus could not have looked weaker, more miserable, more detestable, or more despised than when He hung on the cross to His dying breath. Yet, come and see, for that is where He shed His blood for thee. Come and see, but you may not see what you want to see. 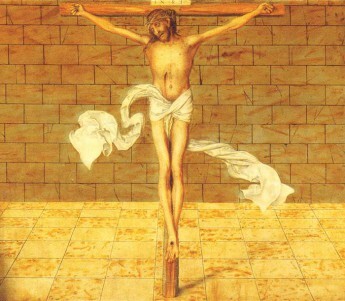 Jesus on the cross was not a beautiful sight to behold. Neither is Jesus in the Sacrament of the Altar. Yet both are the simple realities of Jesus’ Word. You are a sinner in need of forgiveness and Jesus has died for you on the cross and gives you forgiveness freely in His body and blood. Given and shed for you for the forgiveness of sins. You cannot convince someone to believe. I cannot convince someone to believe. The only way that anyone comes to faith is through the Word of Jesus. So, come and hear the Word of Jesus. Invite others. We don’t need distracting flashy gimmicks or useless silly tchotchkes to give away. We don’t need anything other than the Word of Jesus, which is the Word of life. Come and see. Come and hear. Amen. Dear believers who have the right to be children of God: grace, mercy, and peace to you from God the Father and our Lord and Saviour Jesus Christ. Amen. The Word made flesh would not be stopped. Our Psalm asks, “Why do the nations rage and the peoples plot in vain? The kings of the earth set themselves, and the rulers take counsel together, against the Lord and against his Anointed” (Ps. 2). What useless and vain plotting and scheming. Nothing could stop God’s plan of salvation. The Word became flesh. King Herod in all his power was a pathetic puppet of Satan in his vain attempts to kill the baby Jesus. God warned Joseph to flee to Egypt so that Herod’s attempts to murder Jesus were unsuccessful. In his fury, Herod murdered all the male children in Bethlehem who were two years old or younger, but Jesus he was not able to kill. God had a plan and a time, that was not it. Nothing would stop God’s plan of salvation. The light came to shine in the darkness, and the darkness could not overcome it. He came to His own, but His own did not receive Him? That did not stop the Word made flesh. There was no room in the inn? That did not stop the Word made flesh. The great red dragon sought to devour the child of Mary (Rev. 12:1-6)? That did not stop the Word made flesh. The Word made flesh came to be the life of men. He came to us in our hall of death, to breathe our poisoned air, to drink for us the dark despair that strangled our reluctant breath (LSB 834 st. 3). He saw our wretched state, as we lay fast bound in Satan’s chains, with death darkly brooding over us; sin tormenting us night and day. God’s Anointed had compassion on us, and brought us salvation; from sin and sorrow setting us free. He slayed bitter death for us that we may live with Him forever (LSB 556 st. 2, 4, 5). The Word made flesh would not be stopped. His opponents and enemies did not stop Him. The temptations of the devil did not turn Him aside from His plan of salvation. Nothing stopped Christ’s plan of salvation from the manger to the rough wooden cross. No price was too high to pay, even His own life He gave for us sheep who love to wander. He would not be stopped. The Word made flesh is not stopped today either. He rose from the dead and sits at the right hand of God the Father Almighty. He is your light and your life, and He has given you the right to be children of God, by the will of God. And He will not be stopped. His forgiveness to you will not be stopped. The nations can rage and the peoples plot against God’s children, but it is in vain. The kings of the earth can set themselves, and the rulers can take counsel together, against the Lord and against his children, but it is useless and in vain. Our governments can pass whatever laws they like; they can ban every Christian belief, every Scriptural truth. They can take away the livelihoods of believers and imprison us for our faith and put us to death. But the Word made flesh will not be stopped. He will not stop saving His people who cry to Him for help. The pathetic and powerless hands of earthly kings and authorities will not prevent God from saving us. God laughs at any attempts of rebellion against His Word. “He who sits in heaven laughs; the Lord holds them in derision.” God ridicules and mocks those who think they’re going to stand in the way of God’s salvation. The Word they shall let remain. They may not receive it. They may not care for it. They may hate it. It matters not. The Word made flesh shall return to judge the nations and break them with a rod of iron and dash them in pieces like a potter’s vessel. God’s plan of salvation for you will not be stopped. God’s claim on you through the waters of Baptism cannot be undone. His adoption of you as His child cannot be overturned. They body and blood of Christ that you have received have placed you in communion with Christ and it will not be reversed. This means your salvation is firm and secure, no matter if the nations rage and the peoples plot against you. No lies or slanders against you will prevent your salvation. Not war. Not hunger. Not old grudges or fresh wounds. Not bad news from doctors, teachers, or the stock market. Not new laws from a wicked government. Not even death can prevent your salvation. Death has lost its sting, the grave its victory. Your salvation cannot be undone because Christ’s birth for you cannot be undone. The Word became flesh and dwelt among us. This is a fact that endures forever. Your salvation cannot be undone because Christ’s death for you cannot be undone. His death for you has paid the price of your sins forever. Your salvation cannot be undone because Christ’s resurrection for you cannot be undone. As surely as He lives and reigns to all eternity, so you also will live with Him in everlasting righteousness, innocence, and blessedness. Let the nations rage. Let the peoples plot in vain. Let us join our Lord in heaven who laughs and holds them in derision. The Word made flesh was not stopped and will not be stopped. He is our light and our life, and it will not be undone. Amen.